Despite being illegal, protests against President Lukashenko’s new “Law on parasites” (an attack on the unemployed) took place on the “Day of Will”, supposed to mark the 85th anniversary of the founding of the Belarusian ‘peoples’ republic’. During the last week, following Lukashenko’s promise to delay implementing the law, the regime has done everything possible to prevent the protests. The television news was full of ‘exposes’, claiming the organisers wanted a new “Orange revolution” (a reference to the protests in Ukraine), saying that foreign powers, the US or Russia, would exploit the protests and warning about the impending “spread of fascism” from Ukraine. At the same time, a wave of “preventative arrests”, of reportedly up to 500 people, took place to frighten off protesters from participating. Protests broke out almost spontaneously, earlier this year, after the government introduced a new tax effectively on the poor and unemployed. The protests found opposition parties, both pro-European and pro-Russian, off their guard. Now the opposition leaders have woken up and are trying to take control of the protests and, in doing so, are helping to disperse them. In many towns across the country, the regime negotiated with the moderate opposition to allow for sanctioned gatherings to celebrate the Day of Will. In contrast, many of the protesters were not prepared to dissolve the protests in this way and continued to organise non-sanctioned marches in the country’s key cities. As in all the countries of the former Soviet Union, the various imperialist powers try to intervene in such processes for their own interests. On 21 March, a coordinating committee of moderate opposition figures failed to take place due to a lack of quorum – some of the members had been arrested but also, according to information we received, two of the leading members were summoned to the US embassy 30 minutes before the meeting was due to start. It seems that their US advisors were concerned that the Day of Will would turn into another Maidan and open up another front of confrontation with Russia, which, at the moment, it appears, the US want to avoid. It seems that both Western and Russian powers are content with Lukashenko staying in charge. Notwithstanding all this, several thousand protesters attempted to march in Minsk. They were met by the riot police with water cannons. Hundreds were detained. This could be anyone found carrying a placard or seen to be organising. Several foreign journalists were also arrested. Detentions continued over the weekend. Last Sunday relatives and friends who turned up outside police stations to demand the release of those detained were themselves arrested. Events in Minsk, however, were just a taster of the protest movement that exploded across Russia on Sunday. As the clock moved across Russia’s nine time-zones, in nearly one hundred cities, beginning with the far-eastern cities of Vladivostok, Khabarovsk and Komsomolsk-na-Amur, hundreds and sometimes thousands turned out for illegal demonstrations, to protest at the corruption of the ruling elite. They were met by riot police, who detained often tens, sometimes hundreds of participants. In Vladivostok, over 40 were arrested. As the protests spread across the country, 2,000 turned out in Irkutsk, in Siberia, and in the Siberian capital, Novosibirsk , 4,000 protested. Around 2,000 attended protests in the Urals city of Ekaterinburg and another 2,000 in Chelyabinsk, in the Volga region. Samara, Voronezh and Kazan all saw demonstrations of between 1,000 and 2,000. 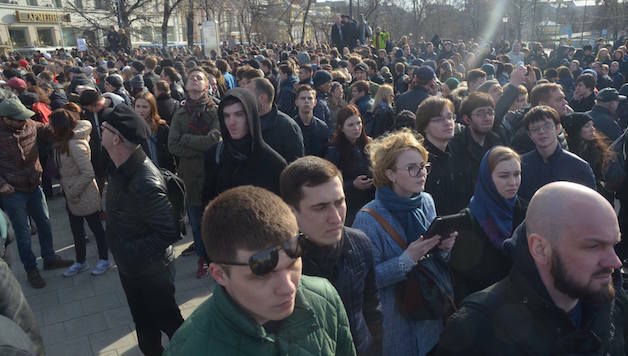 Protests took place in cities where such opposition would not be expected, such as in the north Caucasus, in Krasnodar and also the capital of Dagestan, Makhachkala. There were even small protests in Simferopol and Sevastopol, the Crimea’s two major cities. In little Gatchina, in the North western Leningrad region, 15 turned out and 7 of them were detained. However, the prize goes to the two major cities. In St Petersburg 10,000 to 15,000 flooded the Winter Palace courtyard before moving down the Nevskii Prospect. The police reports over 130 were arrested. In Moscow, another 15,000 flooded the city’s main street, Tverskoi prospect, which leads to the Kremlin. The Moscow police and riot police did not hold back. By evening, over 1,030 people were sitting in the city’s police cells. Many reporters and photographers, including UK Guardian reporter, Alec Luhn, found themselves arrested. There were many reports of people being badly treated, with some ending up with cracked skulls. The official Russian media completely ignored these events. It is reported that they had all received a warning on the day before to ensure that their coverage “was professional”. But today (27 March), political commentators are drawing comparisons with the ‘Bolotny protests’ that rocked Moscow five years ago, when protests mounted against fraudulent election results. The media almost breathe a sigh of relief, when claiming that, like Bolotni, the regime will ride out the protests and that protests will eventually die down. But there are very important differences between last week’s explosion of anger and that which took place five years ago. Yesterday’s protest was called single-handedly by the opposition leader, Alexei Navalny. A lawyer with neoliberal and Russian nationalist views, Navalny became well-known through his blogs against corruption and the research conducted by his ‘Ffoundation for the fight against corruption’. For his campaigning, spent already five years in jail and he is currently serving a further suspended sentence. He has announced he will stand against Putin in next year’s presidential election. In announcing his candidacy, Navalny adopted a completely new strategy for the Russian opposition. The Bolotni protests were isolated in Moscow; although they attracted the support of a wide layer of younger workers in the capital, they were led by a coalition of the neo-liberal politicians, such as Boris Nemtsov (later gunned down in the centre of Moscow) and the billionaire oligarch Michael Prokhorov. The ruling regime used this association and claimed that the Bolotnii protests were anti-working class. The regime also organized rallies in cities such as Chelyabinsk, in opposition to the protests in Moscow. Navalny has drawn the conclusion that the opposition needs to not only spread out geographically but also to make a more direct appeal to the working class. He puts to the fore issues such as the defence of education and healthcare and has called for a national minimum wage. Indeed the literature his campaign distributed in Moscow in the lead up to last weekend’s protests concentrated on these issues. For this, Navalny has been completely spurned by other neo-liberal opposition groups and leaders – standing up for workers’ rights is, of course, anathema to such people. Navalny has been touring Russia to open up campaign offices across the country. His foundation has also produced a video exposing massive corruption centered on Prime Minister Dmitrii Medvedev, which, although completed ignored by the national media, was viewed 11 million times on facebook. The other very significant feature of these protests has been the complete dominance of youth. Bolotny saw a combination of older former anti-Soviet dissidents and the usually middle aged supporters of the traditional liberal opposition, with the participation of a layer of students and young workers. But recent protests were 95% youth, with the participation of many school students. Many school students were detained and some were beaten up by the police. The social networks have been full of interviews and comments by these youth. A 17- year old from Krasnodar, for example, explained how he was removed from politics and interested just in music. But three years ago things began to change after the unification of Crimea to Russia. “You know,” he said, “I was used to not thinking about politics and politics did not interfere with me but then began all this ‘Crimea is ours’ madness. At school they started all these celebrations over the re-unification of Crimea. For hour after hour they started to tell us about all these ‘evil men from America’ and the main theme of history lessons became that the west wants to destroy Russia. On top of this the school was visited by a long stream of priests and Cossacks. … I realized that something was wrong, so I started to watch the political talk shows on TV – but I soon switched them off, not just because they were pure propaganda but they were just shouting at each other. So, I drew the conclusion, maybe we have this situation because people are not interested in politics – maybe that’s why for my whole 17 years there has been just one president…will I go to the demonstration? If the authorities sanction it, then I doubt it. But if they ban it, I will definitely go”. The first Bolotnii protest was not sanctioned but the tens of thousands who turned out for it treated it as an open display of political ideas with banners and leaflets, and long speeches from the podium. Repression only followed when the mood started to tire and there was a brutal police attack on the demonstration and the arrest and imprisonment of many activists and even passers-by. But last weekend, the authorities decided to use repression from the very start. However the anger is such that it has just made people more determined. When Alexei Navalny was arrested yesterday in the middle of the protest, other protesters started to drag parked cars to block the police bus from driving away with him. The fact that the protest was banned meant it had a completely different character to other protests. Navalny called for his supporters to turn up on Tverskoi street as if they were going for a walk and to just walk up and down the street. There was to be no placards, banners, leaflets or speeches. As soon as anyone stood out in any way, with a hand-made placard or by starting a chant, they were arrested. One video shows a squad of riot police charging into a crowd to arrest a young man who placed a hand-drawn sign onto Pushkin’s statue. But the fear of repression has not worked it appears. As one arrest was taking place, the crowd started to chant, “You can’t arrest us all!” In St Petersburg, as the protest was moving down the Nevsky, one media reporter tweeted that the police were surrounding the protest, but then soon changed his line, “Oh, now the protesters are surrounding the police”. People are waiting to see what the next action will be. For the first time for many years, there is a figure who is seen as an alternative to Putin. Reports from the Kremlin indicate that the ruling clique are not sure what to do with next year’s election. The leader of Crimea recently stated he thought that a ‘Tsar’ would be the best option for Russia, before quickly correcting himself by saying he thought Putin would be the ‘best Tsar’. Another commentator suggested that as there is no genuine opposition candidate worthy of Putin, the election should become a plebiscite to extend his rule. Latest reports suggest that the Kremlin has decided not to allow Navalny to participate in the presidential election. But this is a very risky strategy given the growing dissatisfaction in society at the economic crisis and the increasingly reactionary social policies of the regime. The problem is that Navalny is not a genuine fighter for the rights of workers and youth. At the same time, to say that there was a political vacuum evident in last weekend’s protests is a big understatement. At least in Moscow, where police control was much more rigid than in other cities, there was not a single political group participating (apart from Socialist Alternative), not a single leaflet distributed or party flags or placards displayed. Unusually for a protest so dominated by youth in Moscow, there was not even an anarchist presence. This is, of course, partly because the police quickly arrested anyone seen to be acting in such a way. But it is also because of the criminal sectarianism of many left groups, who have no idea about how to intervene in such events. However, ‘Socialist alternative’ (CWI in Russia) was present on the Moscow demonstrations, with a specially produced handout issue of our paper. Hundreds of copies were distributed in just 15-20 minutes. That evening, hundreds visited the Socialist Alternative site, seeking information about events. The only way for this movement to develop in a way that can genuinely solve the problem of corruption, education, healthcare and poor wages and pensions, is to unite the wider working class. This begins with youth in action against corruption and the power of the billionaires. It is inextricably linked to building a genuine democratic socialist organization that is capable of fighting for political power. Previous articleTrump prepara deportaciones masivas: Debemos resistir, manifestarnos, bloquearlas e ir a la huelga!